The Tudor Murder Files has recently been featured in The Express for their article The Real Life Horrible Histories. Read it here! 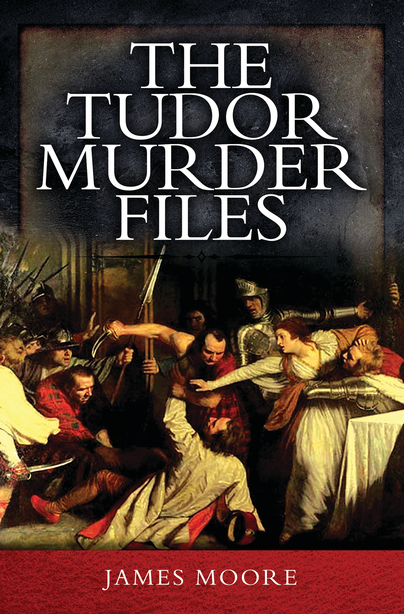 You'll be £14.99 closer to your next £10.00 credit when you purchase The Tudor Murder Files. What's this? In the Tudor age the murder rate was five times higher than it is today. Now, in this unique true crime guide, the Tudor Murder Files reveals just how bloody and brutal this fascinating era really was. From the dark days of Henry VIII to the turbulent times of Shakespeare, James Moore’s new book is the first to chart the period’s most gripping murder cases in all their grizzly detail. Featuring tales of domestic slaughter, sexual intrigue and cunning assassinations, as well as murder mysteries worthy of Agatha Christie, the book vividly brings to life the violent crime wave that gripped the 16th century both at home and abroad. Enter a world in which stabbings were rife, guns were used to kill victims for the first time and in which culprits frequently escaped justice. The book also reveals just how severe some of the penalties could be, with gruesome punishments for those who dared to commit the gravest of crimes. Discover how one murderer was gruesomely ‘pressed to death’, another boiled alive for poisoning his victims and meet some of history’s most notorious serial killers. The Tudor era can be less immediately accessible to us in the 21st century than, perhaps, the Victorian era; with the latter, we can understand our ancestors though newspapers and photographs - but the Tudors can seem far more remote. James Moore attempts to bring them to life here: ironically, through detailing a multitude of violent deaths! His book trawls the archives for accounts of crimes and punishments, and presents them in an entertaining, unstuffy way. He draws comparisons between the Tudor times and the modern day - for example, a case in the 16th century Worcestershire and the crimes of Fred and Rose West in 20th century Gloucester. It's all drawn from impeccable sources, and it makes for an enjoyable read (if that's the right word for a book about murder). But more importantly, it makes our Tudor forebears' lives more vivid, showing the disputes and violence that frequently marred their lives, as well as detailing the response of contemporaries to these dark deeds. Only a few centuries ago, life was so cheap, you could be wandering around the court in the morning, and be dead in the afternoon, at the whim of the monarchy or one of its representatives. I don't suppose that Tudor times were any worse than previous times, but they certainly seem to have something of a reputation, which James Moore's excellent book celebrates in some style! If you are interested in social history by getting into the detail of serious crime in any period establishes how people lived and in the case of this book died! This was a delightfully gruesome and fascinating look at murder and punishments during the Tudor period. Investigation techniques along with punishments and even case files are shared in a very easy to read and engaging way. If you are a fan of crime and the macabre, then this book is not to be missed. I can't believe I loved a book about murder so much. The Tudor Murder Files was so interesting and enlightening about the time period. Death was all around the people whether it was murder or disease. James Moore gave a perfect amount of detail in each chapter. I couldn't put the book down. Morbidly fascinating collection of murder cases, mainly from the sixteenth century. Investigation techniques and punishments are also discussed in detail. Ideal for fans of true crime or Tudor times alike. All in all, a decent read for those with an interest in true crime or history of crime. This book provides a nice overview of murder, punishments and investigative techniques of the Tudor era. It was nice to see the inclusion of crimes I already knew a little about (Amy Robsart, Lord Darnley, David Riccio) along side many I never heard about. It's an interesting read for anyone interested in true crime or history of crime. An interesting book covering well-known and less well-known murders of the Tudor era. With as much detail as possible, and relying on pamphlets printed at the time, this book explores a more violent age where death was a constant threat and policing nonexistent. Morbidly interesting, this provides a pretty good look at murders, punishments and investigative techniques of the Tudor era. Sometimes it could get a little dry, but for the most part it was not a bad read. It did not rely to heavily on direct quires from primary sources, which is great because they can sometimes be a bit of a challenge to a more modern reader. He does cover the few Tudor murders I was already familiar with (Amy Robsart, Lord Darnley, David Riccio) and many others that I hadn't. All in all, a decent read for those with an interest in true crime or history of crime. James Moore is a professional writer who specializes in bringing to life forgotten aspects of history. His work has appeared in titles such as The Daily Express, Sunday Telegraph and The Daily Mirror and he is also the author and co-author of seven other books including Murder at the Inn: A History of Crime in Britain’s Pubs and Hotels, Pigeon-Guided Missiles: And 49 Other Ideas that Never Took Off; Ye Olde Good Inn Guide and History’s Narrowest Escapes. All have achieved widespread coverage in national and local media.